Since seeing a screening of Les Miserables on Saturday I can't think of anything but the movie and the music. I've been bursting into semi-song at the drop of a hat - I say 'semi' because I'm not one of those people who know all the lyrics (I want to learn them all now!) - and even if I did know them all, I can't carry a tune. Still that doesn't stop me from belting out a couple of uneven bars here and there. 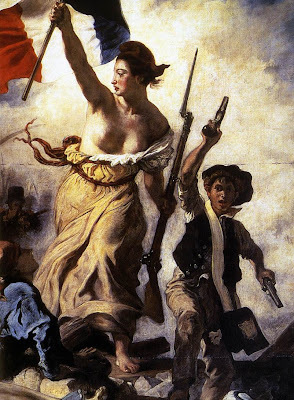 Poor composer Claude Michel Schonberg - who I'm listening to singing en Francais on Youtube as I write this - would be tres triste if he heard me butcher "Can You Hear the People Sing?" Not to mention the French language. My francophile friend Paulita at An Accidental Blog will be more forgiving, I'm sure, at her Monday meme Dreaming of France. 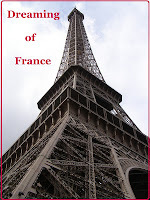 where we share a passion for all things France! While I didn't break out into 'Little People' , Daniel Huttlestone as Gavroche was adorable and absolutely endearing and grabbed at my heart with his gap toothed grin. 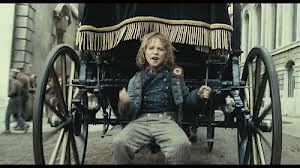 It's not evident in this movie or the stage musical but in Hugo's novel, Gavroche is one of Denardier's sons. How ironic is it that young Daniel Huttlestone's Gavroche speaks in broad Cockney while Sascha Baron Cohen affects one of the few French accents in the film? It's said that Hugo based Gavroche on the young boy in Eugene Delacroix's painting, "Liberty Leading the People" shown above. 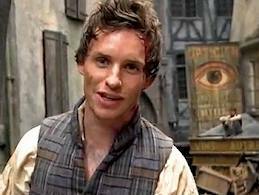 Eddie Redmayne took me by surprise. I wasn't a fan going in - I've bitched about his casting as Marius because I thought he was awful - mostly due to miscasting, I admit - in My Week with Marilyn. And I kinda hate his freckles. When I first saw him in this film I thought 'uck' but he won me over. At the Q&A after the screening, Eddie Redmayne (Marius), there with the director Tom Hooper, Amanda Seyfried (Cosette) and Samatha Barks (Eponime), said Gavroche was his favorite character. He first saw Les Miz when he was a nine year old boy so naturally he identifed with the brave little street urchin and freedom fighter. Redmayne confided that he wished that he could play Gavroche and was seriously jealous of Daniel Huttlestone, the young actor who stole my heart. Redmayne said he told Hooper if he were a little boy at the barricades, he would think it would be totally cool to have tunnels underneath. SPOILER ALERT: Hooper took his advice. Watch for the moment Gavroche peeks out from the tunnel below the barricade. Hooper called Redmayne the 'unofficial assistant director' in charge of the kids! I think it's that essential sweetness that seeps through that makes his performance as Marius so convincing as the young man growing more and more in love. That's what won me over! * We had our favorite seats for the screening - smack dab in the middle of the theatre. It would have been nice to have been closer for the Q&A but MLH did his best to capture it with his cell phone camera. I'm glad that you loved it so much. I'm a bit conflicted about this one. I really want to see it. But I do usually want to read the book first, I just know that I won't be reading that doorstop of a book for quite some time. So I hope that I will get to see it in the cinema. It doesn't open here til Boxing Day (same day as The Hobbit). I feel the same way but I also know that at this point in my life I can't see finishing such a huge novel. The must be volumes that any film would have to leave out - I imagine both the stage musical and the new movie musical really only hit the highlights but what amazing highlights! Ha ha! The last thing I am is an insider. But I really can't stop thinking about the film as well as what they said about it in the Q&A.